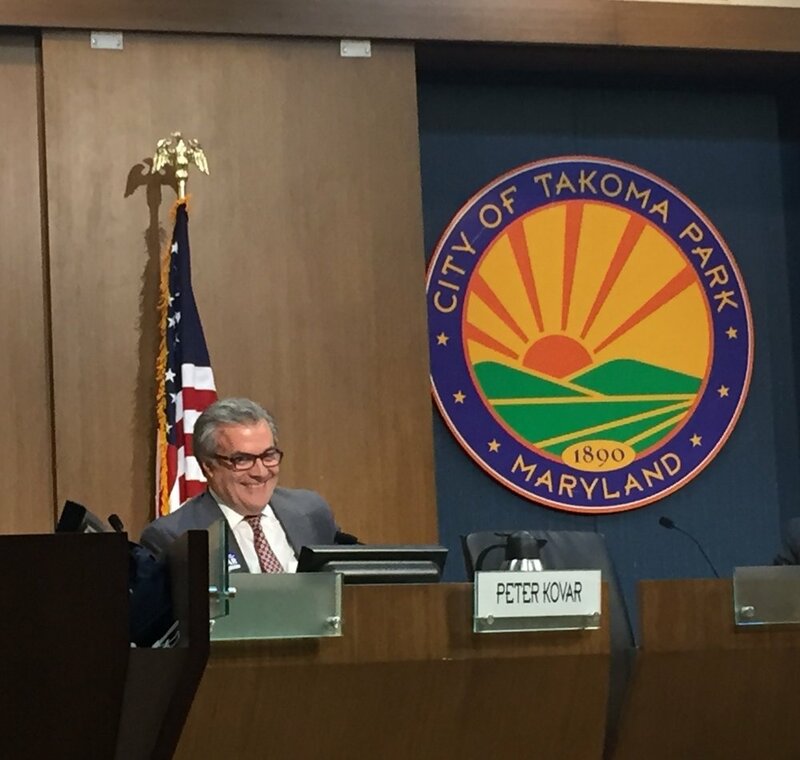 Here’s a link to the agenda for the June 20, 2018 City Council meeting: https://takomaparkmd.gov/meeting_agendas/city-council-meeting-agenda-june-20-2018/. A key agenda item will be the presentation of updated Takoma Junction traffic studies. There will be votes on the proposed land transfer between the City and the former John Nevins Andrews School, and on a contract for the Lunch and Learn program. The meeting will start with a formal recognition of City volunteers. We’ll also hear from the local group M.A.N.U.P. and from the Grants Review Committee on their recommendations for the Community Quality of Life grant awards. Finally, we’ll have a discussion on alternatives to curb painting in no parking areas. The recently established Takoma Park Youth Council has published its first newsletter: https://documents.takomaparkmd.gov/government/boards-commissions-and-committees/Youth-Council/Youth%20Council%20Newsletter/20180614-Takoma-Park-Youth-Council-Newsletter.pdf. The newsletter will give you a good idea of the work they’ve been doing and their plans for the future. I look forward to working with the Youth Council to help encourage greater engagement by younger residents in municipal affairs. With the summer here, many residents are planning vacations. If you’re concerned about the security of your home when you’re away, you may want to consider the Takoma Park Police Vacant House Check: https://mail.google.com/mail/u/1/#search/vcant/16404d5c7117525e. If you’ll be away for at least 4 days, the Police can keep an eye on your property while you’re gone. I’ve used this service myself plenty of times, and it’s very easy to sign up. M.A.N.U.P. https://documents.takomaparkmd.gov/government/city-council/agendas/2018/council-20180620-1.pdf. This organization, known formally as Making A New United People, has undertaken a number of valuable teen and young adult mentoring initiatives, with financial support from the City. I’m pleased that we’ll have an opportunity to hear from the organization about its work focused on underserved youth in our community. Takoma Junction Traffic Studies. https://documents.takomaparkmd.gov/government/city-council/agendas/2018/council-20180620-2.pdf. There are two traffic studies connected to the Junction development, one by the Traffic Group and paid for by Junction Developer NDC, the other by A. Morton Thomas, which was paid for by the City. Links to both studies appear below. Both companies made initial presentations earlier this year, but because the traffic signals in the Junction were still being recalibrated, the study findings were not final. Now -- though based on reports I’ve received from residents, it appears further adjustments to the signal timing may be needed to reduce extensive delays in the late afternoon on Philadelphia Avenue -- the timing is considered complete enough for the two companies to finalize their reports. We don’t know enough yet about the traffic patterns or the recommended changes to the intersection to make decisions on what modifications may make sense. But just about everyone I’ve talked to (regardless of their position on the NDC project) has told me they want to see traffic flows improved. At a minimum, this is an environmental issue (excessive idling of vehicles isn’t healthy and negatively affects our climate); a quality of life issue (long delays are unsightly and inconvenient for residents and commuters); an economic issue (timely deliveries to and easy patronage of businesses can be hindered); and a safety issue (for pedestrians, cyclists, bus riders, and “impatient” automobile drivers). So, whatever we decide on the development project, we ought to seek solutions to the traffic problems there. The challenge will be doing so in a way that’s safe for people using all travel modes; respectful of the area’s historic designation; financially feasible; agreeable to the State Highway Administration (which has technical control over Ethan Allen, Carroll and Philadelphia Avenues); doesn’t unduly impose on near-by residents, is environmentally suitable, and adequately takes into account any new traffic connected to the Junction development and other anticipated projects in the area. Those are all areas we’ll have to continue probing, beginning this week. As for the Junction project itself, and specifically the proposed site plan put forward by NDC, as I see it there are two other key components in addition to traffic. With regard to Co-op deliveries and related operational questions, I’m pleased that we’re moving forward with a mediation process involving the Co-op and NDC (with City representatives as observers), and the recent exchange of letters between the two parties gives me some hope that the outstanding issues can be resolved in a satisfactory way. Separately, I continue to believe that the building height presented in the site plan should be reduced, and especially that the amount of public space at street level should be increased. On that latter point, it looks like I’m in the minority on the Council. In summary, I have some optimism on the NDC-Co-op negotiations, I’m more pessimistic about the public space question, and with regard to traffic I’m still in an information gathering posture. My ultimate position on the site plan will be based on the extent to which there’s resolution and/or progress in these areas, and of course taking into account the views of the community. Community Grant Awards. https://documents.takomaparkmd.gov/government/city-council/agendas/2018/council-20180620-3.pdf. This will be an initial presentation from the Grants Committee, with votes at a later Council meeting. John Nevins Andrews Land Transfer. https://documents.takomaparkmd.gov/government/city-council/agendas/2018/council-20180620-4.pdf. This will be a “first reading” vote, with a second vote at a future Council meeting. When we discussed this topic in our June 6 meeting, in response to a question I asked, City staff said the exchange wouldn’t compromise access to either the school site or Spring Park. In addition, the staff also made it clear in response to another question I asked that the Council retains the right to weigh in on the potential future use of the site for a day care center (a sale of the property for that purpose is in the works). With those assurances, I plan to vote in favor of the property exchange. Lunch and Learn. https://documents.takomaparkmd.gov/government/city-council/agendas/2018/council-20180620-5.pdf. Lunch and Learn is an excellent local program, which offers valuable educational and recreational opportunities to young people in the community. I’ve had the chance to participate in the program, which was a very positive experience for me, and I’ll be enthusiastically supporting this contract. Alternative to Curb Painting. https://documents.takomaparkmd.gov/government/city-council/agendas/2018/council-20180620-6.pdf Before my election to the Council, a decision was made to suspend the use of curb painting to designate no parking areas, except in limited cases (such as near fire hydrants). This decision was driven primarily by esthetic concerns. A number of Ward One residents have expressed to me their view on the importance – if the limitation on curb painting remains in effect – of finding an alternative that would ensure safe and reliable parking. This is a particular concern on busy streets like Piney Branch Road, where residents face serious challenges backing out of their driveways if vehicles are parking too close. Accordingly, several of my colleagues and I called for the exploration of alternatives to curb painting. That led to a City staff experiment in which markings on the street itself rather than the curb was tested out. I’m pleased to see that, after testing this idea, the staff sees it as a viable and cost-effective alternative to curb painting. I’ll be pushing for us to move forward on it quickly. Please feel free to be in touch with any questions or concerns about these or other local issues.